Chinawoman's Chance: Portia of the Pacific Historical Mysteries, Volume 1 is an historical sleuth mystery written by Jim Musgrave. It was 1884, and San Francisco, even more than the rest of the country, was embroiled in a harsh and racist reaction to the recent flow of Chinese immigrants to the United States. The Chinese themselves were caught between the machinations of the ruling Manchu in their home country and Leland Stanford and the other railroad barons, who jointly conspired to keep the immigrants impoverished and bound to unfair contracts. The Chinese Exclusion Act of 1882 made the unfair treatment of those new immigrants into law. Jim Musgrave’s historical murder mystery is a fascinating look at San Francisco in the late nineteenth century. His sleuthing partners, Clara Foltz and Captain Isaiah Lees, are real historical persons, and following the two as they work together in a sometimes uneasy alliance is grand entertainment. A sensitive reader won’t be able to help considering the racism that is at the heart of this story and comparing it with the current attitude toward immigrants and women in the country today. I found myself saddened to think that in many ways we’ve not gone very much farther in our treatment of others, in the disregard of equal rights and fear of diversity. Musgrave’s story is marvelous! He gives the reader a wide range of possible suspects to consider and makes San Francisco of 1884 come to life. I especially loved how he brought together the strong and capable characters of Captain Lees, Clara Foltz, Detective Sergeant Eduard Vanderheiden and Ah Toy. They are a grand team. I was quite pleased to find that Musgrave has written a second book in the series, The Spiritualist Murders, and am looking forward to reading it. Chinawoman's Chance: Portia of the Pacific Historical Mysteries, Volume 1 is most highly recommended. In the intriguing historical mystery novel, Chinawoman's Chance (Portia of the Pacific Historical Mysteries, Volume 1) by Jim Musgrave, a young prostitute's brutal murder unmasks political prejudice towards the Chinese in 1884 San Francisco. After her husband left her, Clara Foltz took the skills her attorney father had taught her and became a legal representative. Clara became the first woman admitted to the California Bar and was a forceful advocate. When a young woman's body was found with her skin removed from her bones in a rented apartment in the Chinese district, the local constabulary immediately gathered sixteen Chinese men and threw them in jail. The Six Companies, ambassadors for the Chinese government, hired Clara to represent them to protect their interests and prove the innocence of the young reporter charged with the murder. Fighting the prejudice within the city government, Clara finds unexpected assistance from a captain in the police department. Clara and the detective work together to find the murderer before an innocent man is hanged. With the clock ticking against them, can they succeed in the present racial clime? 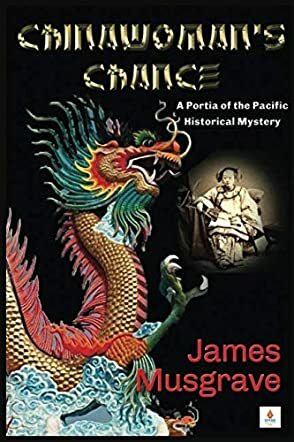 Chinawoman's Chance (Portia of the Pacific Historical Mysteries, Volume 1) by Jim Musgrave is a thrilling murder mystery that takes place in the late nineteenth century. Based on actual people and locations, this is a gripping novel that will keep you on the edge of your seat. The thrilling story moves along at a quick pace, keeping the reader spellbound from the first page to the last. The characters are well-defined and depicted in a genuine and natural manner, making it easy for the reader to relate to them and their era. The dramatic portrayal of their fight against prejudice and chicanery will enthrall those who love subterfuge and mystery set in another time. I recommend this exciting novel to those who enjoy historical stories with murder and intrigue. Chinawoman’s Chance: Portia of the Pacific Historical Mysteries, Volume 1 by James Musgrave is a historical mystery novel set in late 19th-century San Francisco and highlights a fictional account of Clara Foltz, California's first woman lawyer. Though the real Clara Foltz harbored many of the anti-Chinese attitudes of the time period, the fictional version in this engaging mystery has been hired by Chinatown's elite to solve a rash of murders involving Chinese prostitutes. A single Caucasian woman is the most recent victim and there is a renewed fervor to solve the case now that it's being viewed as an important incident. Clara is assisted by Ah Toy, a former Madame turned businesswoman and art dealer, who works as Clara's translator. In a story filled with many twists and turns, Musgrave puts a new spin on the typical historical mystery. Chinawoman’s Chance is a solid read, made more interesting by the fact that though Chinese immigrants contributed a large part in building the city of San Francisco, we don't see many stories about them. Musgrave even manages to competently straddle the racist attitudes of the time period with Clara's fictional progressive demeanor, though there are times when characters and descriptions feel a bit exoticized. Such as the fictional version of Ah Toy having bound feet in a way that clashes with her past, as well as standing at odds with her real life counterpart. That, along with a few other things, kept me from getting as deeply lost in the story as I would have liked, but despite it all, Musgrave manages to deliver a taut mystery that grabs the reader's attention with its approach, twists, and constant action. Good for fans looking for an intriguing and cosy historical mystery. “I tell you, Captain, she was flayed like a dressed deer. Clean down to the bone.” How can any reader not want to continue with this for an opening sentence? Chinawoman’s Chance: Portia of the Pacific Historical Mystery Volume 1 by James Musgrave is not your everyday detective story. When thirty-five-year-old Clara Shortridge Foltz is kidnapped from an arranged tryst with her lover, she is more intrigued than alarmed. The four Chinamen whisk Clara to Chinatown where she meets with a congregation of some of the most powerful yet seedy heads of town. Arrested and accused of the brutal murder of Mary McCarthy, a woman of the streets, fourteen Tong members are in need of Clara’s legal representation. Andrew Kwong has no qualms with an American female representing his compatriots at a time in history when women do not work in such public ways. But Clara’s reputation precedes her and Kwong is confident in retaining her services. James Musgrave bring to the table a different kind of legal thriller. Set in 1884 San Francisco, Chinatown is presented as a victimized community. The story line flows smoothly amid several provocative twists and turns that engage the reader until the very last page. Musgrave utilizes vivid description of setting and plot to lure the reader into the realistic detail of his story. The main character is well-defined and inspiring as a nineteenth century heroine. With its heavy reference to the sexist attitudes of the time, I envision Chinawoman’s Chance as a staple in the library of many historical mystery collectors. My book is now on sale for .99 cents at Amazon. Get it while it's price is looooow!